« Shuttle Endeavour docks with ISS – greet each other. Following on from my blog post entitled “million fax to Washington – 77 days to change the World” i had an interesting e-mail fromRobert Stanley, referring to an article he has made available – i refer to it below in full; quite a few people have expressed an opinion that there will be no disclosure on UFOs, and some saying that the US government have nothing of interest on them. I am going to be honest, and say that i do not know what they have on the UFO subject, but the fact that they have given us nothing of worth, is not helping them at all. This is reflected in the light that the french have given us UFO information, and recently the British government, has started giving us UFO files (the first batch in may, another in November and more on the way). This is to be commended, and therefore it follows, that the US should at the least, give us what information they have similar to the British government (although this is not disclosure as such, it would be a start). I also wonder, how much the goverments of the world know on UFOs, and whether they have just ignored it, feeling that it will just go away (hopefully). Therefore i feel it is worth taking part, as the more pressure we can place on those in government, the more likely we are of achieving our goals. We all have different goals and different expectations, but i believe that we should all unite, and exert pressure, to demand more on what they know about UFOs. The post by Robert Stanley: [please note: due to the size of my page on this blog, i had to redo the article from Robert Stanley…..i hope i have done it reasonable justice,if not i apologise…please see the original article here ]. Your campaign was based on a simple, but profound promise — change. 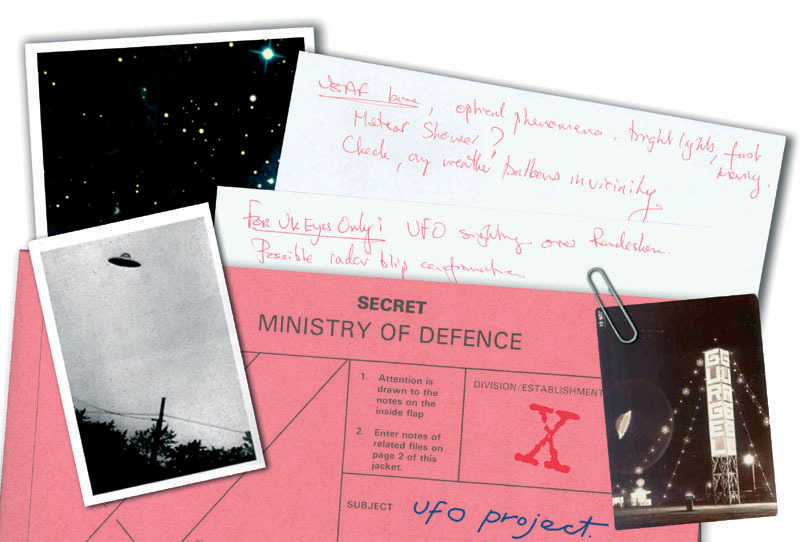 There is one important aspect of the current bureaucracy in Washington, D.C., that desperately needs to change — UFO secrecy. As president elect you have most likely been briefed on the more than 240 alien incursions of the restricted/prohibited airspace over Washington, D.C., that have transpired since 1948. Pentagon intelligence officers may have also briefed you on the failed military intercepts that occurred in this same period. Some of these hostile intercepts proved fatal to our veteran, combat pilots — a tragic waste of life. However, the attempted military intercepts in 1948, 1952, 2002, etc. are what directly led to the current political stance on this subject — total silence. Despite the fact that hundreds of people have seen and or photographed non-terrestrial, exotic aerospace craft passing over sensitive areas of Washington, D.C., we are told that officially nothing unusual is going on. This situation has got to change. However, I am certain that your transition team leaders, specifically John Podesta, will urge you not to address this issue publicly. You see, in 2005, soon after i broke the story internationally of UFOs being photographed over the Capitol, I spoke at length with Mr. Podesta’s public relations firm in D.C. because they had issued press releases regarding their desire to end UFO secrecy . Therefore, it seemed like a good idea to contact them because I was looking for a public official to address the UFO situation in D.C. on the record. However, I was told by Podesta’s people that despite the fact that most of these violation of U.S. airspace by UFOs were witnessed by credible citizens of D.C. and or seen or radar scopes, and or photographed, no one holding political or public office would be willing to officially address the issue. The reason for the official silence was actually quite simple. No one really knew what to do about it. More importantly, if an elected official were to officially admit anything publicly regarding the ongoing UFO incursions of U.S. airspace… that individual (and perhaps their federal agency) would be held personally responsible by the public to deal with the problem. During your campaign, you stated your willingness to have a dialogue with all world leaders regardless of their political views. Are you also willing to engage in an open, diplomatic dialogue with the occupants of the unidentified aerospace craft visiting Washington, D.C.? If not, why not? As reported in my book “Close Encounters on Capitol Hill,” according to NATO’s classified UFO threat assessment in the 1960s, many of the occupants of these exotic space craft are in fact human and that the others species were various types of intelligent humanoids. More importantly, NATO concluded that these interplanetary people did not pose a direct threat to our national or international security. If that is true, then why should we continue to deny the existence of human beings from other worlds and refuse to engage them in open, diplomatic debate? In closing, I would like to make it crystal clear that this is an ongoing situation that will not go away simply by ignoring or denying it exists. 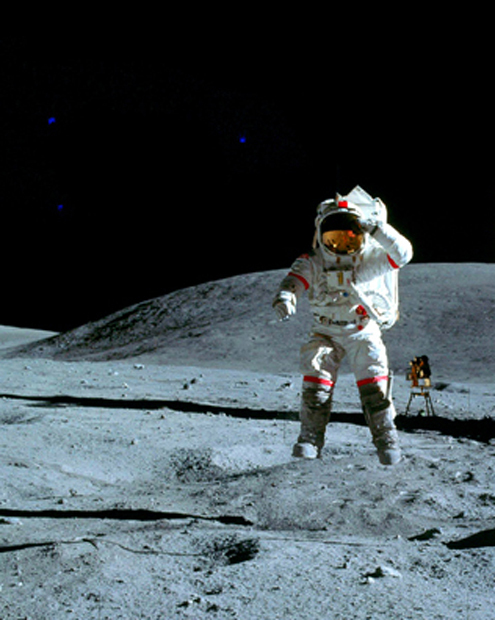 Exotic, non-terrestrial spacecraft have historically been sighted and or photographed all over the world. But, they are extremely interested in Washington, D.C.
To illustrate my point, listed below are some of the most recent eyewitness accounts and photographs from our nation’s capital. The following violation of controlled airspace took place in Washington, D.C., at approximately 9:00 p.m., on September 23, 2008. According to one of the witnesses, “My family and I were driving down Constitution Street when we first saw three unidentified lights moving very smoothly and rather slowly behind the Freedom statue that stands on top of the Capitol building’s rotunda.When we got to Union Station, we had a better view of the Capitol and the UFOs were still in sight, but now they were going in a different direction. On our way back home, we got the best view yet of these UFOs. Another violation of controlled airspace transpired in Washington, D.C., at 10:06 p.m., on August 17, 2008. 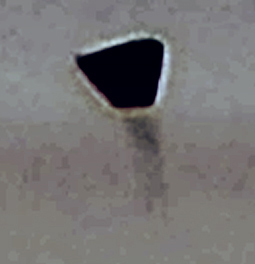 According to the photographer/witness, “While standing on a roof top on 13th and N streets NW, I captured a high-resolution image of a spherical UFO that left a trail of energy as it accelerated into the night sky. © WGA 2008 – Note triangle of lights in the upper left corner. Another violation of controlled airspace took place in Washington, D.C., at approximately 8:00 p.m., on August 13, 2008. 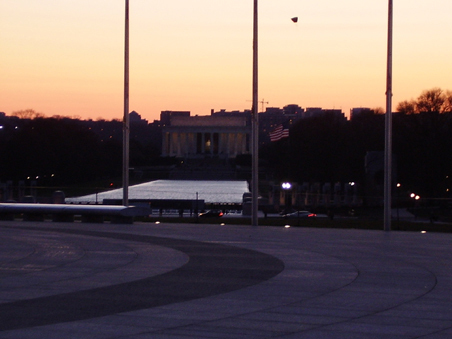 According to one of the witnesses, “My friends and I were on a trip to D.C. That evening, we were walking west on the National Mall towards the Smithsonian Metro Station when I noticed a strange object in the sky. It appeared to be cylindrical in shape and dark, gray maybe or a dull metallic color; it was relatively well offset by the colors of the evening sky so it was plainly visible to the naked eye. It seemed to be fairly large and distant and was totally stationary for some time. After I first noticed it I didn’t point it out until I realized that it had not moved at all for close to thirty seconds. I then pointed the UFO out to my four friends who all saw it, but we could not decide what it was. The general consensus seemed to be that it might be a kite of some sort, but to me it seemed too high in the sky and too large to be a kite. Also, the area of the sky [which is restricted/prohibited airspace] it was in did not see like a place where anyone would fly a kite of any sort. I pulled out my cell phone to take a picture of the UFO. The clouds behind the object could be seen clearly on the screen, but the UFO did not appear in my camera despite that fact that as I mentioned before it was plainly visible to the naked eye, a fact that I pointed out to my friends who all saw it. If I recall correctly, I also heard someone in another group that we passed that night mention that they witnessed the UFO. The strange object remained stationary for several minutes before moving slightly down and to the right and away from our view. 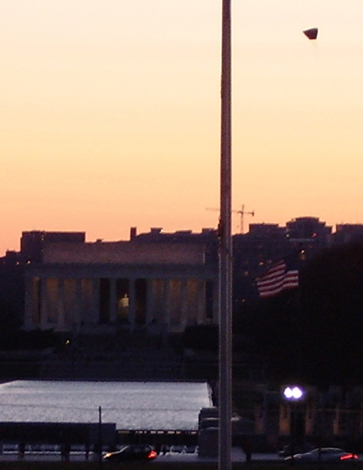 The object was perhaps 30 to 40 degrees in the sky to the WNW, generally in the area of the sky between the Washington monument and the White House, but probably more distant. Another violation of controlled airspace occurred in Washington, D.C., at 8:09 p.m. on August 4, 2007. 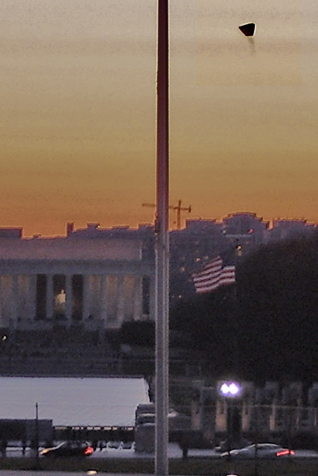 An anonymous photographer was taking pictures while standing at the Washington Monument which is the center of P51 (prohibited/restricted) airspace of the nation’s capital. The photographer did not see the triangular UFO while taking the picture. Photographic analysis shows the UFO was emitting an exotic energy field propulsion as it moved through the sky — see image below. Apollo 16 – Compare the triangular formation of UFOs above to the July 1949 Pentagon photo. UNICUS is not affiliated with any religious,philosophical or political organizations. I would like to thank Robert for giving his permission to allow me to place this article on this blog. This entry was posted on November 17, 2008 at 10:00 pm	and is filed under "Flying Saucer", are we alone?, flying Disk, IFO, news, science, science and the future, the universe, ufo, ufo cover up, ufo in north america, ufo in uk, ufo updates, ufo's, ufo's in USA. You can follow any responses to this entry through the RSS 2.0 feed. You can leave a response, or trackback from your own site. Just wanted to point out that the Disclosure Project National Press Club was done in 2001, not in 2007 like you mentioned at the end of this article. Thanks richard, you are right! 2001 it was.